In the last post, I have explained how to show af:message programatically. In some cases the user may need to show a multi-lines message, in this post I will explain how to do this. af:message allows us to include a formatted text in the message, this can be done by surrounding the message text with <html> tags. So to show a multi-lines message, we can use <p> tag in our message text. 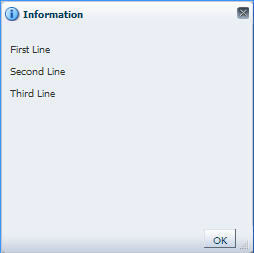 The method below displays three lines message.